Even though Billy sometimes doesn’t know what’s growing in our vegetable beds at all times, he’s very likely to correct you if you call this place Novella’s Farm or Novella’s Garden. “That’s *Bill* and Novella’s Farm,” he’ll say. And he’s right. I couldn’t do half the things I do without him. It was with a big heart and much joy that we celebrated our 11th anniversary by riding our bikes across the Golden Gate Bridge. Yup, two Oakland hicks tackling the Big City. Of course, like everything we do, there were some disasters. Like when we tried to ride our bikes on the highway. Enough cars honked and yelled that we figured out we were total dumb-asses. 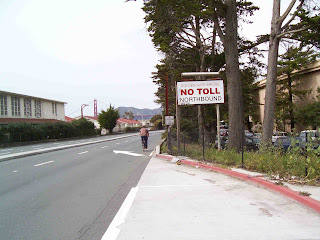 Bicyclists should really ride through the Presidio, or snake along Chrissy Field and get to the entrance of the bridge that way. 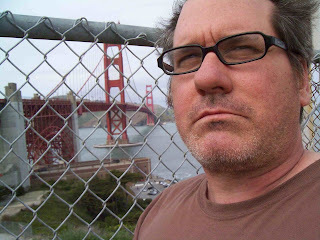 The bridge is a dream of red and blue. How can it be so perfect? 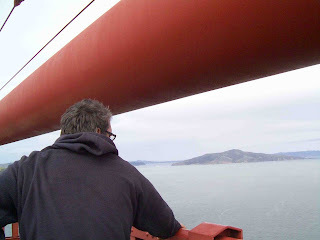 We took a ferry back to SF from Sausalito then another ferry to Oakland. It was nice to get a break from the farm, my farm hand partner at my side. 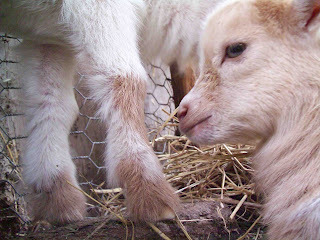 For those of you who can’t snuggle up to the little goaty ones, here’s a photo that attempts to get close enough that you can. almost smell their heads (grassy with a touch of milk). The whole family loves our back stairs. 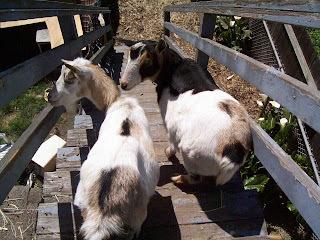 I realized we have a pretty good set-up because the goats get their exercise running up and down the stairs all day. And lately the little ones set up camp in a secret spot between the roof and the back porch. It’s the perfect nook that probably appeals to their cave-dwelling instincts. A goatlings day involves drinking from Bebe, playing, eating a little bit of grass, taking a nap, peeing, eating, then making tiny yellowish orange turds, then more napping. At night they sleep in a straw-lined caged run with Bebe and Bilbo. This chicken wants to know why she isn’t getting as much attention. So many reasons. 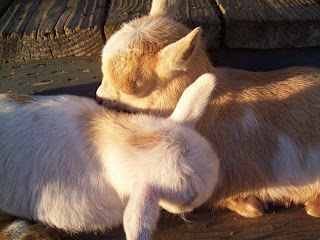 The cutest goats ever. I started milking Bebe, too, just to get her used to my human hands. Those babies are getting some yummy, creamy, sweet-tasting milk! Lucky little devils. Now then, onto pot pies. Bill has a joke from some dumb movie where he says, “woman, make me a pot pie.” For Easter, instead of clobbering him like I usually do, I actually made one. 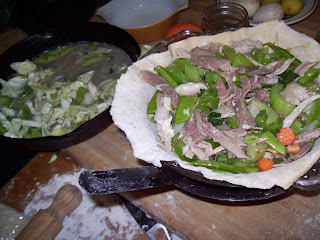 First I followed the dough recipe from Hugh Fearnley-Whitingstall’s opus: Meat. His was for a kidney pie, but the crust–made with my piggies’ lard and a touch of butter–was thick enough to pour in liquid without fear. Then I chopped onions, picked celery (!) and herbs from the garden, and threw them together with the turkey stock and meaty bits. Hugh told me to add a decoration on the crust, so I crafted a very jankity nest with two eggs–see them in the corner there? 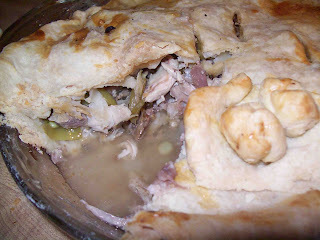 Then I sealed her up, baked for an hour, and there you have it: turkey pot pie. Come join us for a fermented food feast and celebration of Urban Agriculture to Benefit West Oakland’s City Slicker Farms “growing fresh and affordable produce for West Oakland”. There will be a presentation on the work of City Slicker Farms by founder Willow Roesenthal, a slide show of international urban agricultural by UCB lecturer Nathan McClintock, live music by Zoyres Eastern European Wild Ferment, and a live ferment workshop. Bring a fermented food and get entered in a drawing to win Homebrew, Sauerkraut, Plant Starts, and Gift Certificates to the Berkeley Farmer’s Market. Cost: A donation of $10-30 sliding scale is requested, no one turned away due to lack of funds..
To Archie we had to bid a farewell. Last night I ate his organs, today I’ll probably make turkey pot pies, and Friday I’m bringing marinated turkey breasts to my friend’s house for dinner. But I’m getting ahead of myself. As you may recall, Archie the male turkey, a beautiful Royal Palm, gobbled enthusiastically. Maybe too enthusiastically. In the past week he made some kind of noise every five minutes. He would stand on our back porch and gobble at the top of his throat to the entire neighborhood. He would preen next to the fence and yell at every passer-by on our street. On Sundays this was very loud, as there’s usually a soccer match down the street. And the mornings, he would gobble in the morning until I came out to feed him. 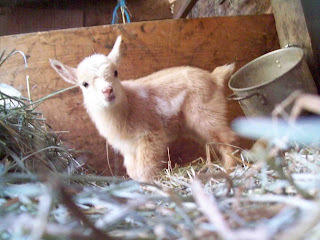 Finally, two days ago, as I was in goaty bliss, our next door neighbors told me the turkey was driving them crazy. 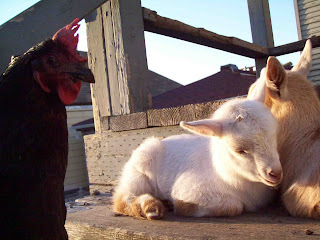 On an urban farm, neighbor relations are critical. If they complain, I could be cited, and who knows, they might take my animals away. So I boiled a big pot of water. Then I got out the tobacco, burned a chunk of it, and grabbed Archie for a death hug. Novella in the garden with a pair of pruners. He made a hissing noise, pecked me, and then his head was off. I dipped him in the hot water, and pulled off his gorgeously and soft feathers. Underneath he had softer white feathers. Then alabaster skin, puffy with fat. In his crop were chunks of corn and greens. 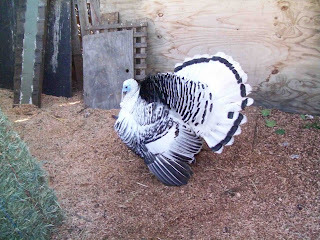 He was the most healthy turkey I’ve ever plucked. Underneath his skin, I could see the promise of his dark meat–the color of chocolate. This British chef I love Hugh Fearnley Whitingstall calls these delicacies plucker’s prizes–the organ meat, not enough to serve, but enough for a special meal for one. 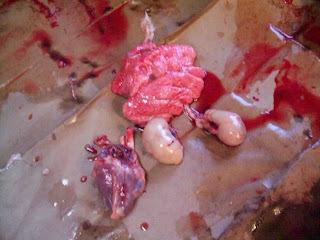 I fried the kidneys in butter with thyme and a squeeze of lemon. The liver and the heart I cooked with onions and thyme and pepper. 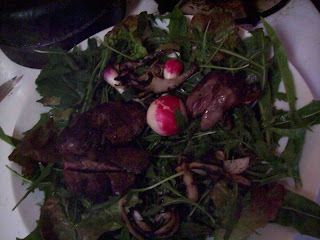 Served on a bed of wild argula and lettuces, and some radish. Edith is still on the nest, and we hope for baby turkeys in a few more weeks. It’s much quieter now. Goodbye Archie–and thanks. I woke up at dawn to the turkey gobbling. This is fairly normal. He gobbles like a rooster crows—in the morning and throughout the day. It’s driving us crazy. But he was gobbling over and over again, a danger gobble! So I ran downstairs and Bebe came running up to me, bleating and looking at me with distress. Tail up. That’s always a sign of pending birth. But I thought it wouldn’t be for another two weeks! 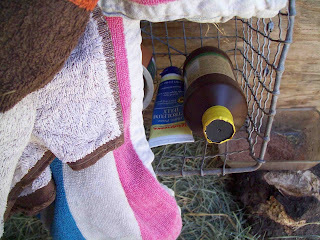 Luckily, I’m obsessive, so I had all the supplies—the iodine, the petroleum jelly, gloves, towels, bottles, colostrum, beet pulp and oats—ready to go. I gave Bebe her favorite snacks of jade plant, Heart to Heart flakes, and apple, then went back to bed. I had a dream that she had four tiny babies and one of them was a cow. 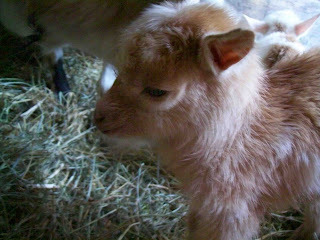 A few hours later not much had happened—I went to a meeting–but Bebe was still bleating every five minutes or so. I didn’t see her dialated or anything. So I went out to do some errands. Got a new tire for the truck, bought some plants and seeds. When I arrived home I went directly to the backyard, and saw a streak of gold and white. Two adorable babies! Still wet, and covered with goo. 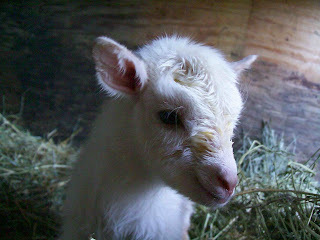 Bebe had the afterbirth hanging out her backside. She was patiently licking her kids clean, and making wonderful deep bleating noises, which they would answer with high-pitched calls. After a bit of staring and feeling tremendously good, I crawled into the pen and helped Bebe out a bit—washing off their faces, and dipped their umbilical cords with 7% iodine solution (to prevent infection). When I picked them up, they cried like babies! 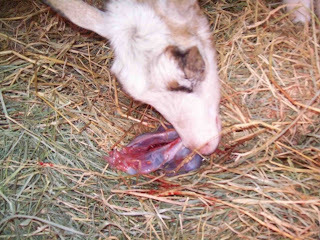 Bebe gave me some licks, then she ate the placentas. How funny it is to observe an herbivore eating something so bloody. It seemed like a chore. I gave her some beet pulp and oats warmed up with water, and she drank a ton of water. She’s had several other kids, so this just seemed like another day in Bebe’s life. 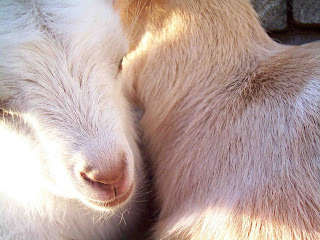 The goatlings are adorable, playing with each other, sleeping, and when you lie on the ground near them they come running toward you. So cute! For those of you wondering, Bilbo seems bored by it, and a little left out, like Eoyore. 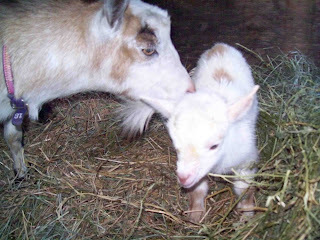 The birth of two beautiful baby girl (pretty sure) goats, today around 4pm. They don’t have names yet, but since they were born on St. Patty’s day, I think they need Irish names. Please send suggestions. More info about the birth–and photos–to come.